The crew at NECA Toys is celebrating the release of the excellent Toys “R” Us Exclusive Alien vs Predator Kenner Style 2-Pack. If you missed it, we had an exclusive first look at the set, which you can see by Clicking Here. NECA has posted a cool new gallery. Their photographer, Stephen Mazurak, recreated the Dark Horse Alien vs Predator comic using new photographs to recreate the scenes. The 2-pack should be hitting stores now. Keep an eye on the Product Page in case it comes back in stock as well. Check out the comic by reading on and check out NECA’s Site for even larger sized pages to download. This special edition action figure 2-pack is a loving recreation of this classic pairing from the 1994 Kenner toy line. It includes Renegade Predator with rifle, bladed weapon, and interchangeable masked and unmasked heads. He is painted in an all-new color scheme with brown armor, faithful to the original Kenner release. The Alien uses the 1979 “Big Chap” body with a glossy black dome and darker black decoration, again faithful to the original Kenner version. Each 7″ scale figure features over 25 points of articulation! BONUS – also includes a special reproduction of the original Dark Horse mini comic book, just like the original Kenner release. Read on to check out 75 high resolution photos and our review. If you missed it, there’s a great looking Kenner Homage Warrior Alien vs Renegade Predator 2-Pack coming from NECA. Last night NECA shared out a sneak peek at the packaging. The new images shows part of the back of the packaging, which will feature a mini checklist of Alien and Predator items. Last week they shared out an image showing the Warrior Alien art for the packaging. The 2-pack is scheduled for a release this Fall. Check out a new photo of the upcoming Renegade Predator coming from NECA. This is an in-progress paint sample and is not final. This will be part of their Alien vs Predator 2-Pack, which will also include a Warrior Alien. The set is an homage to a classic Kenner 2-pack featuring the same characters. The Renegade Predator will include swappable masked and unmasked heads, a gun and a blade staff. See the new image by reading on. It’s Friday morning here, and NECA has started with a great #facehuggerfriday reveal. They are going to have a Kenner throwback Alien vs Predator 2-Pack. 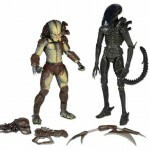 The set, which is set for a Fall release, is an homage to the classic Kenner Warrior Alien vs Renegade Predator 2-Pack. We’ll have more info as it becomes available. See the photo by reading on. NECA is on an astonishing 13th wave of the Predator series of figure. There’s no sign of slowing down as they keep giving fans exciting new takes on the galactic hunters. The series 13 figures are all based on designs from the classic Kenner Predator toyline. These include the Scavage Predator, the Cracked Tusk Predator and the subject of today’s gallery; the Renegade Predator. The figure includes weapons based on the original Kenner figure as well. NECA was gracious enough to provide Predator Series 13 for review, and we’ll be sharing our thoughts and photos over the next few days. We have over 45 photos for you to check out of this fantastic figure. Read on to see those and our review. At Toy Fair 2015, NECA displayed some of the most highly anticipated releases in their Aliens line up. They also showcased new Predators from their upcoming Alien vs Predator series as well. These characters were featured in the pack-in Alien vs Predator comics from the Kenner toy line.The figures will all stand over 8″ tall, feature over 25 points of articulation, and include numerous accessories. Check out the official pics after the jump.